From here you can access the Consultations that we were involved in. We have received a DOE (Department Of The Environment) – Road Safety and Vehicle Regulation Division consultation for a – Proposal for the Mandatory Wearing of Helmets on Motor Tricycles – in Northern Ireland. This would mean that the wearing of helmets for riders of, and passengers on, motor tricycles used on public roads in Northern Ireland would be a mandatory requirement. Although the Environment Committee’s public call for evidence closed on 21st August 2014 the bill is still going through parliamentary procedures at the Northern Ireland Assembly. Right To Ride has submitted written evidence to the Northern Ireland Assembly, Committee for the Environment regarding the Road Traffic (Amendment) Bill. As proposed we would see a major change in road traffic legislation. Basically this would see the introduction of a lower blood alcohol limit for drivers, with a more stringent limit for new drivers and professional drivers. It also proposes changes for learner drivers through its reform of driver training and testing, a Graduated Learner Driving Scheme as well as restrictions on new drivers. And a requirement for quad bike users to wear helmets while on a public road. The response by Right To Ride to the Road Traffic (Amendment Bill) concerns itself mainly with the effect that the bill, if introduced in its present form, would have directly on motorcyclists and where we consider necessary, the impact to motorcyclists in relation to other vehicles or their drivers. CLOSED: This discussion is now closed. The DfT are now considering what you have told them and they will be using it as the basis for a formal consultation on possible changes to the law. They expect to launch the formal consultation on the GOV.UK website in 2015. A public consultation on proposals to reduce the number of uninsured motorists. The proposal on Continuous Insurance Enforcement scheme, which was introduced into GB a few years back, would make it an offence to be the keeper of an uninsured vehicle, rather than just to drive when uninsured. The consultation also includes removal of (i) the vehicle insurance check when taxing a vehicle and (ii) the need to return motor insurance certificates if a policy is cancelled mid term. At Right To Ride we decided not to respond. The reason behind this was that we regard the proposal for the introduction of the scheme more a fait accompli than an actual proposal. CLOSED – Responses by 4th February 2014 – write to your MP with any concerns at any time! A couple of weeks ago we published an article No More “Tax” Disc?, about the government’s plans, which at the moment is draft legislation regarding the withdrawal of the “Tax Disc” that we currently have to display on vehicles. While this may seem to be delving into conspiracy theory, actually it refers more to a much boarder debate about the ownership of personal data, specifically in relation to your vehicle and how this data can be used either by government or even by the private sector to monitor your habits and movements. CLOSED – An ongoing issue as the Minister and Unions Tackle the issue! With less than a week in his new “job” the new Minister for the Department of the Environment (DOE) Mark Durkin is continuing his predecessor, Alex Atwood’s defence to keep the delivery of vehicle and registration services here in Northern Ireland. The Department for Transport (DfT) in London has announced a consultation which will look at centralising the delivery of vehicle and registration services at the Driver Vehicle Licensing Agency (DVLA) in Swansea. The consultation on moving DVA services finished on the 11th September 2013 – however you can read ongoing reporting around the issue in the comments on the issue! 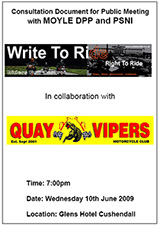 Since we originally reported on this campaign by the Yorkshire Region of the Motorcycle Action Group (MAG UK), we have had some background conversations to clarify some of the finer details. 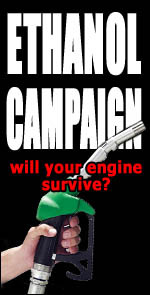 The Yorkshire Region of the Motorcycle Action Group (MAG UK) has launched a campaign regarding the maximum permissible content of bio-ethanol in petrol, from 5% to 10% (known as E10), under EU directive 2009/30/EC, which is due to come into force in 2013. The campaign is requesting confirmation that the key recommendations made in the independent QinetiQ study commissioned by the Department for Transport (DfT) will be implemented, prior to the EU directive 2009/30/EC, coming into force next year. In addition to this the campaign is lobbying that all fuel pumps should be clearly labelled with the bio-ethanol content of the fuel, giving the consumer a clear and informed choice. Specific guidance and recommendations should also be made widely available, as the majority of owners are unaware of these potential issues with their older vehicles. 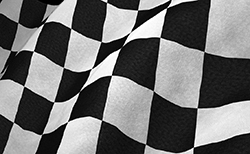 On Wednesday 10th July 2013 Roads Minister Danny Kennedy launched a public consultation on proposals to amend Road Racing legislation in Northern Ireland. Closing date for responses was 7th October 2013. The DOE (Department of the Environment) has issued a consultation paper which is seeking views on proposals to introduce mutual recognition of penalty points between Northern Ireland and Ireland for the offences of speeding, drink/drug driving, non-wearing of seatbelts and using a mobile phone while driving. Currently, vehicle drivers including motorcyclists from Northern Ireland detected committing a motoring offence while driving in Ireland escape the consequences of this when they return home, as it is not possible under existing legislation to endorse their driving licence with any resulting penalty points. Closing date for responses was Tuesday 14th May 2013. 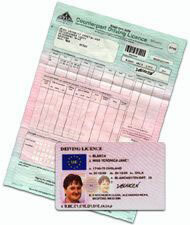 This directive voted on and passed in the European Parliament in 2006 must enter into force as of 19th January 2013. We welcome your views, questions and queries, you can also leave your comments and read about the ongoing stakeholders group meetings and issues. 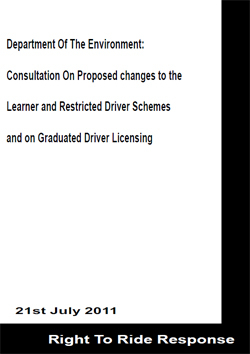 P ublic Consultation on proposed changes to driver licensing fees announced. 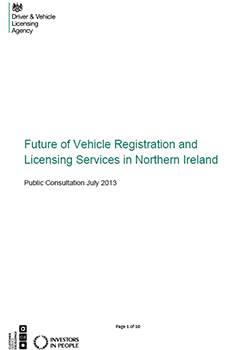 The Department of the Environment has announced the launch of public consultation on proposed changes to driver licensing fees in Northern Ireland. The public consultation will run from 14 May 2012. Subject to the outcome of the consultation and Assembly approval, the new fees will become effective in October 2012. Learner divers should be instructed and taught how to interact not only with the road but with other road users, in our specific case motorcycles (Motorcycles – Scooters – Mopeds), which then asks the question of what is actually being taught to Learner drivers? 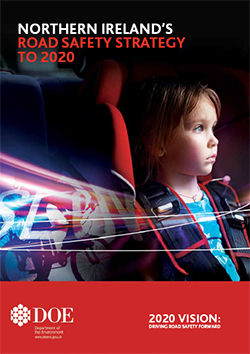 The Road Safety Strategy to 2020 – Vision: Driving Road Safety Forward was publish on 15th March 2011. 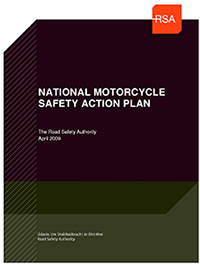 Read the document, comment on the aims to improve not only motorcycle safety but safety for all road users. We generally agreed with the positive spirit of the consultation paper, but we had concerns about some of the action measures. Prompted by two motorcycle fatalities in the Moyle area in April, one on the A2 “Coast Road” Right to Ride was invited to attend meetings with the Moyle District Policing Partnership (DPP). The outcome of this consultation was the setting up of the Motorcycle Initiative Ride It Right. 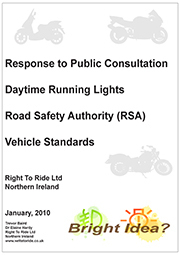 Right To Ride has replied to a consultation on Daytime Running Lights (DRL) from Ireland’s Road Safety Authority (RSA). 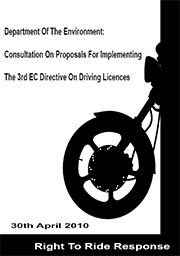 The consultation sought the views and advice of interested parties on introducing DRL measures earlier than an EC (European Commission) Directive. The directive aimed to make dedicated DRL mandatory for all new cars and light vans from 2011. Right To Ride has submitted a response to the Road Safety Authority (RSA) consultation which seeks to obtain the input and views of a broad range of stake holders on the enhancement of motorcycle safety on Irish roads through the development of a fully integrated Motorcycle Safety Action Plan.